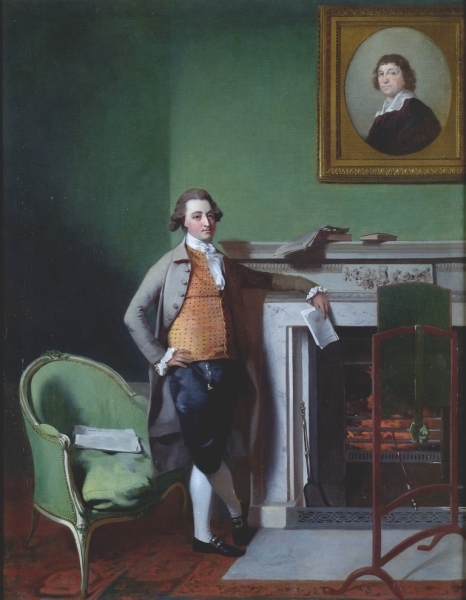 This portrait by Norfolk squire Henry Walton depicts the actor William Brereton in an elegant parlour. Walton probably studied with Johan Zoffany and specialised in full-length portraits on a small scale. His subject was born in Bath, the son of Major William Brereton, Master of Ceremonies of the Lower Assembly Rooms. The oval portrait conspicuously displayed on the wall behind Brereton is by Benjamin Vandergucht (1753–1794) and has recently come to light. It depicts the versatile comic actor Henry Woodward (1714–1777).